This dental malpractice lawsuit was filed in Montgomery County after a Chevy Chase plaintiff's dental implants were improperly done. It was filed in Health Claims Arbitration on January 30, 2017, and is the 48th medical malpractice case (3rd dental malpractice case) filed in 2017. Plaintiff is injured at work, and two of his upper teeth are broken near his gum line. A month later, he goes to defendant dentist in Montgomery County who removes the remainder of the two teeth and places root form implants in their place. After six months, plaintiff returns to defendant dentist. The dentist places porcelain crowns on top of both of the implants. Two months later, plaintiff begins to have mobility around one of the implants, and it looks like the crown is separating from the implant, so he returns to defendant dentist. The dentist makes a few attempts to remove the crown, performing excessive curettage of plaintiff's gum tissue around the implant, and injures the tissue. After this, plaintiff goes to a maxillofacial and oral surgery, who finds that the implant needs to be extracted due to crested bone resorption, inadequate buccal bone over the implant, and gingival recession. Additionally, the other implant has to be extractive due to the excessive curettage of the gingival tissues. This is a little bit different than most of the dental malpractice cases we see. At least three-fourths of these cases are nerve injury claims. Dentists commit malpractice all of the time. Yet they are rarely called to the mat to account for their mistakes. Why? It is hard to find a lawyer willing to take these cases where the patient suffered real harm but does not have a meaningful permanent injury. The cost of bringing a malpractice case can be significant, so a lot of lawyers shy away from these cases. But the reality is that a dental malpractice case in Maryland is usually a case where you need one expert to bring a claim and the facts are rarely complicated. A dental malpractice case is like an auto tort case in terms of complexity and cost. So, again, why don't more lawyers file them? Few Maryland lawyers are equipped to handle medical malpractice cases. Those that are generally looking for larger cases. This claim is also likely a workers' comp claim and the malpractice injuries should have been paid by the comp carrier. 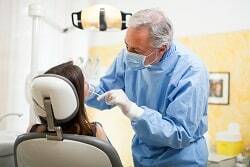 Have you suffered a dental injury due to the negligence of a dentist? Miller & Zois can help you get the compensation and justice that you deserve. Call us today at 800-553-8082 or get a case review online.